PC Bacon Marmalade in the left corner and Skillet Bacon Jam in the right. I’ve been meaning to do a tête-à-tête with my two bacon spreads for a while so why not kill two birds with one stone? 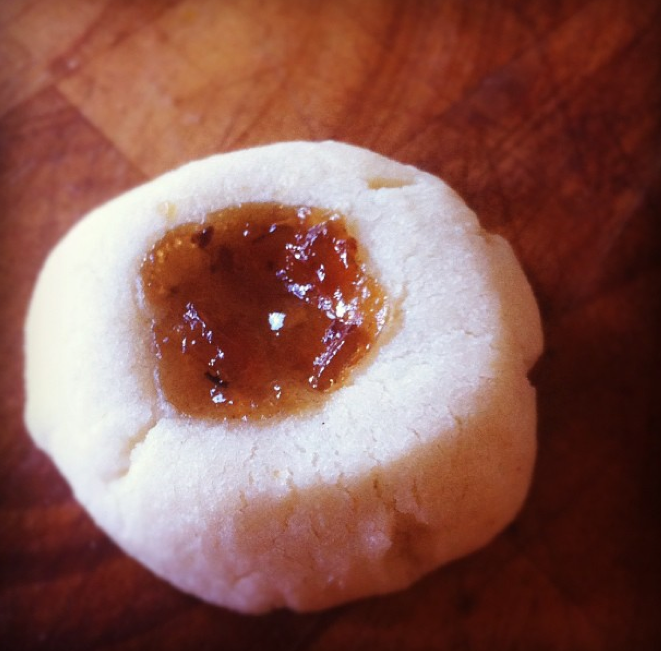 I was making thumbprint cookies for the holidays and they have convenient little holes for filling. I hoped bacon might infuse some sweet/savoury magic into my cookie tins. Plus bacon in dessert is so overdone already, what better time than Christmas to overdo it? The President’s Choice Bacon Marmalade, though a knock-off of the Skillet Bacon Jam, is actually quite different. It’s made with caramelized onion and balsamic vinegar and is much sweeter than the Skillet Spread. Great with an aged cheddar on a cracker or in grilled cheese, it has a more typical marmalade consistency with spice and orange peel. The bacon element adds savour but as an afterthought. As you can see there is a clear winner in the looks department. 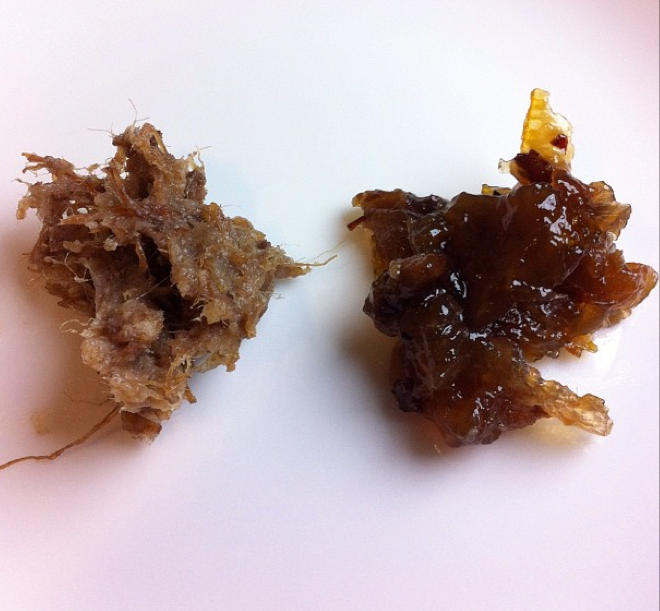 The bacon jam is a BEFORE picture and the marmalade is the AFTER (once the jam has shaved, flossed and waxed). 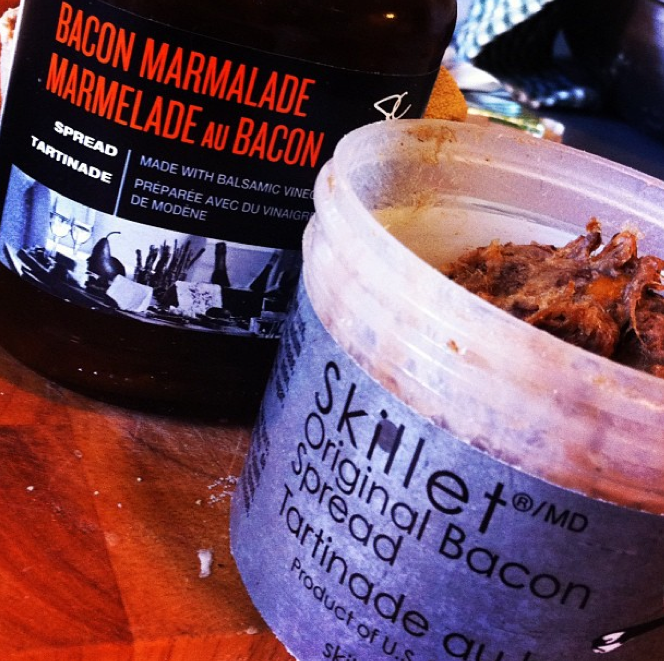 Skillet bacon jam is meaty, smoky, pulled pork like in consistency. It has bacon flavour full force. It’s “smack me so I stop eating this” kind of good. Smoked bacon is the first ingredient in the Skillet product and sugar is the first ingredient in the PC marmalade. Depends how much jam you want in your bacon jam. Back to the cookies. I am happy to report that all cookies turned out pretty tasty. The sweet/sour character of the Bacon Marmalade’s balsamic vinegar and caramelized onion base was very complimentary to the buttery cookie. 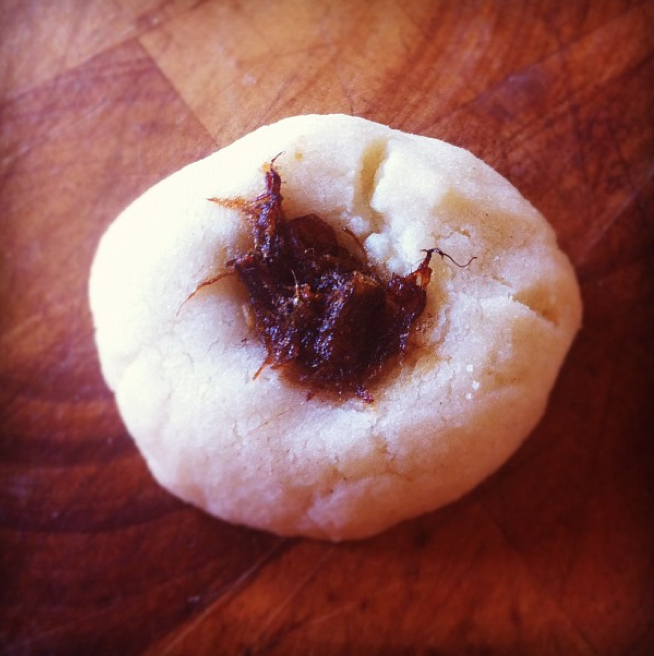 But it was the Bacon Jam thumbprints that surprised me. Because to be perfectly honest, I had a hard time taking a bite. It’s the image problem again. You’d rather get a piece of coal in your stocking than have this show up at your door. It’s like The Cat Came Back in a cookie. Now I'm thinking hide the bacon jam INSIDE the cookie. They look furry, to put it kindly. But they tasted fantastic. The sweet, the salty–it was a darn good combo. But you’d have to serve it to people at night, with no lights on. No candles. Not even Scentsy. But, on the bright side you could all be comfortably naked. And blissed out on bacon. Oh to eat meat again! These look delicious and buttery! Mmmm. I feel you are right Vic–and to be honest–my favourite thumbprints are still with sour cherry jam!